I received a Celtic Knot shortbread pan for Christmas from a sweet aunt who understands my love for baking. My neighbor gave me a box of shortbread cookies and I was immediately hooked by the crunchy, buttery, yet melt-in-your-mouth taste of these cookies and had to make them! You don't have to have a stoneware pan to make these cookies, but they sure are pretty, aren't they? You can use a 9" round cake pan for this recipe. Room temperature salted butter (yes, salted butter is used. If you use unsalted butter, add 1/4 t. salt per stick of butter) is beaten till light and creamy. 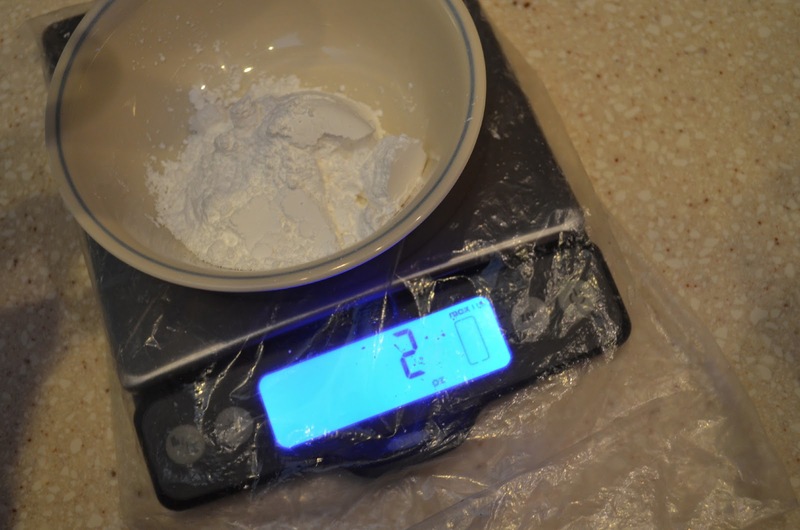 Powdered sugar, is weighed (yes, I weigh my ingredients whenever possible!) and added with vanilla and almond extract if desired. I love this OXO digital kitchen scale! but keep beating until the dough comes together. I cut this recipe in half for a couple of reasons. First, I only had one stone pan, and second, I wanted to see how this recipe turned out, and third, I didn't need a whole batch of butter cookies to wreck my diet, right? Lightly grease your pan. (I used canola oil) If you are using a 9" round cake pan, you can grease it, line it with parchment paper, and grease it again. Trace a circle on your parchment paper, using the 9"round pan as a guide and cut it to fit your pan. This will help the cookie release nice and easily. Press the dough into your prepared pan. I found that it is easier to use a piece of plastic wrap to help press and smooth the top of the dough. I totally forgot to do the next step: prick the top of the dough with a fork to prevent the dough from bubbling. After baking to a light golden color, it looks like there are no bubbles on the surface. Find a thin, thin, knife and run it around the entire edge of your pan. My offset spatula worked great. Place a pan or cutting board on top of your baked cookie and flip it over to release. Use a sharp knife to cut each round in wedges, and transfer to a wire rack to cool. 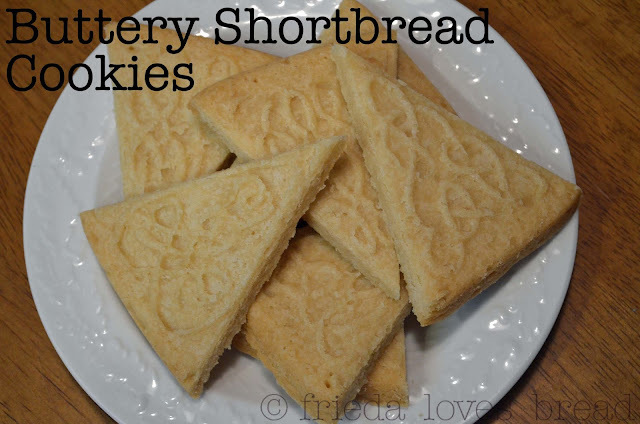 These cookies were even better than the store bought shortbread cookies ~ crunchy, light, buttery, and melt-in-my-mouth delicious! This basic recipe would be great with any of your favorite extracts: almond, lemon or drizzled with white/dark chocolate. This is a very simple, easy, and elegant recipe to make with all the ingredients readily on hand. A great idea for a last minute gathering! Buttery, crispy, melt-in-your-mouth cookies can be enjoyed year round. 1. Preheat oven to 300°F. Lightly grease two round 9" cake pans or line with parchment paper and grease the parchment.2. In a medium bowl, beat butter until light.3. Add sugar, vanilla, (almond extract), and mix in flour.4. Divide dough in half. Press each half into prepared pans, smoothing tops with fingers or mini rolling pin. Prick tops all over with tines of a dinner fork.5. Bake until light and golden, about 30-35 minutes. 6. Remove from oven and immediately turn pan over onto clean surface. Using a sharp knife, cut each round into 12 wedges.OPTIONS:Drizzle with melted caramel, chocolate and sprinkle with chopped nuts.Spread jam on top of each cookie and sprinkle crumbled cookies on top.Add 1/4-1/2 teaspoon eggnog flavor to dough in place of almond extract.Add 1/3 cup finely diced ginger and 1 teaspoon powdered ginger.Add 1/8 teaspoon butter rum extract + 1 cup chopped toasted pecans to dough.